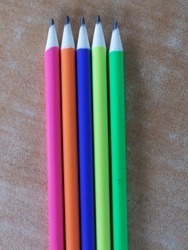 Long Pencils with Neon Colours containg WHITE BASE material. Contains HB lead, Available in 5 different shades. Packing- 10pcs pouch packing. With involvement of high-end technology, modern machinery and advanced tools in all our processes, Geetanjali Exports offers a qualitative assortment of Color Pencil. The offered pencil is widely used in schools. 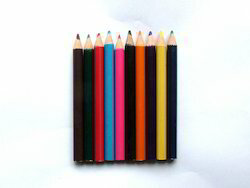 We bring comprehensive array of color pencils for our clients. These color pencils are made of quality wood and lead and are cost effective. The color pencils collection is available as per the industry standard and ensures of durability and longevity. We are engrossed in delivering a broad range of Nataraj Pencil.This pencil gives a dark shade writing with a good flow. Banking on the expertise of our personnel, we have been engrossed in delivering Colored Pencil. Due to the dedication and knowledge of our team, we meet the detailed needs of the clients within a given phase of time. Our firm is offeringa wide range of Doms Color Pencil. These are made using the top quality material and advanced techniques. We are looking for export queries from USA, Australia, New Zealand, Europe, Italy, Germany and Gulf Countries. OMARAM OVERSEAS EXPORTS DEALS WITH All Types of Stationery Items. These are sourced from reputed companies, who use quality raw material for manufacturing their products. Our stationery items are widely used by various college & school students and in many offices.